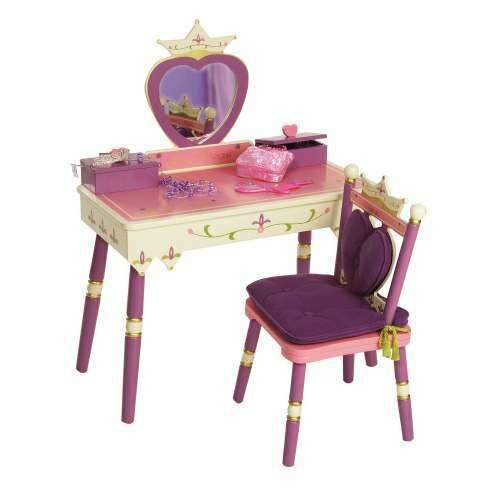 "Heart-shaped mirror with crown Special Message: Always a Princess Chair has crown backrest with removable heart-shaped back cushion and regal padded seat cushion with gold tassels Two heart-topped boxes with hinged lids store jewelry, makeup and other treasures One has a music box that plays Pomp and Circumstance". Brand: Levels Of Discovery / NOT "noooshi"
If you have any questions about this product by Levels Of Discovery / NOT "noooshi", contact us by completing and submitting the form below. If you are looking for a specif part number, please include it with your message.